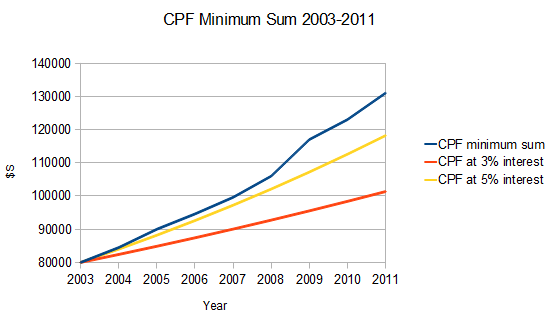 CPF minimum Sum is something you cannot withdraw. It was initially set at S$80,000 (in year 2003 SGD) which will be eventually raised to S$120 000 (in year 2003 SGD). If someone who will reach 55 years old in 2011, deposit S$80, 000 into CPF in 2003 -- he will find himself around S$30,000 short if CPF fixed its interest rate at 3%. The 2nd way is by fiat, for example, the increase of minimum sum from S$80, 000 to S$120, 000 (both in 2003 SGD). Nevertheless, I believe 90% of Singaporean would have nothing to withdraw given that our CPF has already been vacuum cleaned by HDB/property much earlier. We are going to be broke. Speaking about being broke, Lim Swee Suay said this is not the situation which the government is working towards. It seems you do not believe what he says. I concur all the money will go to paying for the hdb. There is nothing to take out. Mah bow tan knows this and he proposed to downgrade and sell your hdb to retire. I need to admit this article is too short to cover the whole picture. Hence, "Defaulting CPF X" will still have couple of series more, so that readers will get the big picture. HDB and property is now a cancer of Singapore. PAP minimum law ensures that even if you sell your HDB, you need to give some back to CPF to keep their ponzi going. Worse, with a aging population, no one is going to buy anymore property. Instead, the old are cashing out, a mother of all property crash is imminent. LKY pre-empt this by FT policy, which keep the ponzi going. FT pays into CPF and help the GIC and Temasek ponzi to perpetuate. The music will stop somehow. And Singaporean is going to suffer. Without FT, Singapore property is going to crash more so than Japan, wiping out everything. In the first place, we should pursue to "geneva" model. Geneva's population is just 19 000. It ban foreigner from buying property. Up till now, its real estate price is around 3-4 years income of worker. The greed of PAP has destroyed us.